This section is to help beginners sort through the almost infinite gear choices out there. I've put these gear picks together after years of research and testing and feel they are pretty good for most anglers. These rigs are designed for the lowest impact on shoulders and wrists to get the most casts. Granted they are on the light side and makes controlling a strong fish very challenging. note that the videos are of the gear I recommend. https://www.youtube.com/watch?v=hxFnsxXdIhI Fenwick 5.5' EGTS 56ul-2 line 1-6# lure 1/32-1/4. Shimano Stella 1000fb loaded with 4# Ande mono. I tie 1/8 and 1/4 straight to the hook with a Palomar knot. https://www.youtube.com/watch?v=zgr2DtszRv0 Cabelas 10' XML-line 8-15lb. lure 3/8-1oz. Trout and Salmon rod. Shimano Twinpower 1000 with 4# Ande mono. I somtimes use a 2-3' peice of Seaguar Fluorocarbon leader (10-20#) tied to a tiny Spro swivel size 10 and then to the lure with a Palomar knot. 10' Hawaiian Gold and a Shimano Stellafb 2500 loaded it with 20-30lb PowerPro or 30# Cortland and about 3-4'of 30# Seaguar Fluorocarbon leader tied Uni-Uni. Double the braid side. Then use a Macmahon snapswivel from Cabelas for good action and easy changing of lures. My all day whipping rig. https://www.youtube.com/watch?v=8wGxSyIESo8 Cabelas 10' XML-line 10-20lb. lure 1/2-2oz. Trout and Salmon rod. Shimano Stella 5000fa loaded with 40# Powerpro tied with a Bimini and then Uni-Uni with 40# Seaguar leader 3-4' then to a Macmahon snap swivel #2 (44lb) with a Palomar knot. 10' Nitro MH 12-30 line and a Shimano Stradic 8000fi loaded with 65# Tuff line braid. I sometimes throw 3 ozers with this rig. The braid is doubled with a Bimini and then tied Uni-Uni to 80# Seaguar leader 4-5' and then to a Macmahon snap swivel with a Palomar knot. 3 oz. 10' Shimano Tiralejo M 15-30 line 1-3 lure wt. with a Shimano Stella 10kSW loaded with 100# Varivas tied with a Bimini to double the line and then to a Uni-Uni to 100# Seaguar leader and then to a Macmahon snap #4 (100lb) with a Palomar. 5 oz. I use the same rig above for the 5 oz. as well. Based of your recommendations, I went out and bought the Nitro m/h pole today (the tiralejo was too expensive) and am still debating which reel to get. I slapped on my Penn SG5000 for now and went out whipping with my MW 1/2 lures for a couple hours. I currently only have 12# test in the Penn reel and was wondering if you think its too much if I try and whip with one of your 1 1/2 ounce lures? If not, how about a 1 ouncer? Thanks in advance for any input. On the Nitro I use 65# braid. 1.5 oz.ers bring up good sized fish. I actually like throwing the 3 oz. on this pole as it is quite stiff and needs the weight of the lure to load the tip for the launch. How did the 1/2 oz. cast on the Nitro? I would definitely beef up your line and use a leader also. Aloha, m.
The 1/2 oz was actually casting pretty good, but you got to keep in mind that prior to today, the only pole I had was a 7' ugly stick. I was able to get way more distance now with my new 10 footer. My 7 footer was set up with the Penn reel loaded with 12# ande mono. From there I would tie my MW lures (I have two 1/2 ouncers and one 1/4 ouncer) directly with a Palomar to a 24# leader (3 feet long) and then onto a size 3 crane swivel with another Palomar. From there I had a snap swivel on my mainline which let me quickly switch between each lure depending on where I was whipping at. When funding becomes more readily available I hope to pick up the stradic 8000fi to complete the setup. Here's another question. If you dont have a Macmahon swivel, what would be your second choice? 25 bucks for a swivel is kinda steep and for that kind of money I would rather buy another one of your lures! Thanks again for the awesome lures! you get 12 for $25. I've had many of the high quality Sampo snaps open from fish chomping them. Hey Mark it's Jay from Oahu can you post a picture of how your setup is please..
Admin="Powerpro tied with a Bimini and then Uni-Uni with 40# Seaguar leader 3-4' then to a Macmahon snap swivel #2 (44lb) with a Palomar knot." This is with 100# braid tied to 100# Seaguar. Hey Mark what do you think about bimini to Alberto?? 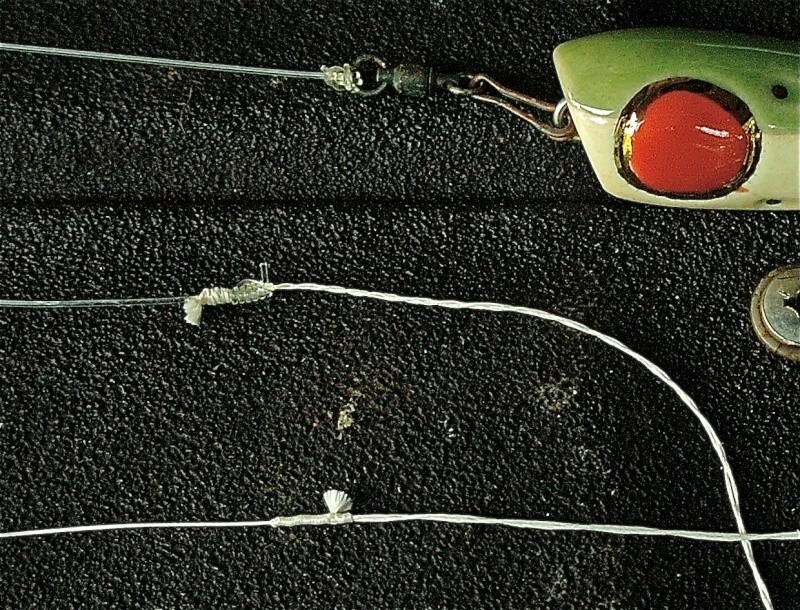 Looks like you just use the looped/doubled braided line and uni-uni to seaguar correct? What do you think about a stradic ci4 4000 on this pole? You think it can handle or too small? Thanks! Seems a bit small for a pole that can launch 1.5-3ozers. I'd use a 8k or bigger. I noticed that the Admin uses 20-30lb PowerPro on a StellaFB 2500. Do you think it's possible to use 20lb PowerPro on a Stradic 2500FI? The max drag on the Stradic 2500FI is 15lbs. What size fish will I be able to bring in with 15lbs. of drag? I actually have a stradic ci4 2500 (and 4000) and I believe the spool is the same size as the stradic fi 2500. I actually put 30lb test (power pro) in my 2500 and was able to get 98 yards. We measured it because I wanted to see how the stats compared to whats on the box, which states it should hold 95 yards. Thanks for responding. The max drag on my Stradic is 15lbs. Do you think 15lbs of drag is enough to bring in small uluas. I don't normally fish with anything bigger than 6# test, but I got spooled twice this month by big omilus. I'm guessing the bigger of the two was 12-15#. I hooked the fish at my feet. This is what got me thinking that I need bigger line. Fishing is getting much better and I want to be ready for summer action. If you guys think my Stradic 2500FI can handle some decent size fish, I'm going to load a spool with 20lb PowerPro. If not, I'm considering buying a larger reel, maybe a Stradic 4000. However, I don't want to buy another real if I don't have to. I'm always surprised what fisherman are able to get away with. If you hook up a Kahala, maybe 20-30lbs. Ulua and big Papio will be more challenging. Thanks again for your quick reply. I think I'm going to load a spool with 20# PowerPro and see how things go. Hopefully I'll get another crack at a big omilu. Thanks for the advice. Cabelas 10' XML-line 10-20lb. lure 1/2-2oz. Trout and Salmon rod. Shimano Stella 5000fa loaded with 40# Powerpro tied with a Bimini and then Uni-Uni with 40# Seaguar leader 3-4' then to a Macmahon snap swivel #2 (44lb) with a Palomar knot. finding anywhere (even online) that sells a good 10' alternative that isn't a big $$$ G. Loomis type. I was looking at the following alternatives. Unfortunately, I can't test out the feel of the rods, as I've only seen them on the TICA website. was slammed on the 5TH CAST I ever made with it. After about a 5 minute fight, the fish spit the hook. I can't guess how big it was, but I can say I was using a Daiwa BG60 reel with 20lb mono and a stiff 9'0"
Ugly Stick Lite rathed at 15-40 LB line. The fish screamed the reel, and would barely budge between runs. the store setting. SEHA rod is a bit short and and stiffer, but is being discontinued and only $52.00. Guess I'll have to bring the reel into the store and see how it feels on them. Aloha MW Forum! I am new to the site, fishing, and lures. I want to learn and get some advice on some poles/reels. For a whipping setup what is better, 10 ft. Hawaiian Gold with Penn 450 (or penn 550) OR 10 ft. Nitro SeaTech with Penn 450 (or 550). Also, what pound test would you guys recommend with those two penn reels if I were going for papio and only whipping. Mahalo and thanks for your guys time! Aloha Mark White! Im not the owner of the He>i company, just a big fan of Jesus! Thanks for the info on the rods and reels. Shucks i would totally run those shimano reels but they are very pricey, i think i have to stick to the penn reels because they are cheaper. Also, im not familiar with fishing terms/knots and after seeing your picture posted with your setup and i no idea what was going on haha. So what is braided line for, and why are the macmahon snapon swivels so expensive?!!! What # line would you recommend to put on a penn 450 attached to the 10 ft. Hawaiian Gold Rod? Also, what is the ratio for leader to main line? Btw I just stopped by Hanapa'a on oahu and picked up 3 of your lures!!! So STOKED! Mahalo for your time and love your lures! I wanted to ask if the Daiwa Coastal is a good rod to throw 1/2 oz lures? I looked at the Hawaiian Gold 10', but I wanted a pole a little bitter stiffer. So I found this one a Daiwa Coastal Rod (North Pacific, not the Hawaii one). It's 10'6", rated for 12-20lb line, 1/2 - 1 1/2 oz lure, regular taper. It's like the Hawaiian rod but it's guides are double footed, stiffer, and the line and lure weight are higher. I would post a link to Daiwa's website but I can't since Im a new member. Going to be throwing it with 1/2 oz lures, 10 lb mono mainline. Anyone have experience with this pole? Not familiar with that rod. I tend to put heavier lures on my rods compared to their rating. I pretty much let the rod throw the lure. It's a lot less work for me. As far as the Macmahon snaps, they definitely act as a line protector whenever the fish inhale the lure. Let us know how the Daiwa goes.